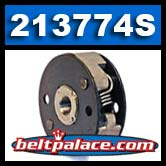 Home > Comet Clutches and Parts > Comet 216776S Clutch Springs for Tiller Clutch (PPFTC14). > Comet 213774S. Comet Industries/HOFFCO Tiller Clutch. 2” Diameter, Threaded Bore. Comet 213774S. Comet Industries/HOFFCO Tiller Clutch. 2” Diameter, Threaded Bore. Comet 213774S. Comet Industries/HOFFCO Tiller Clutch. 2” Diameter, Threaded Bore. HTC Homelite Tiller part 213774-S.
ONLY THREE LEFT IN STOCK: ORDER NOW! 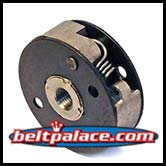 Replaces: HTC—Hoffco/Comet Industries 213774-S, AYP AY213774S, Dixon 213774S, Husqvarna 213774S, SEARS/CRAFTSMAN PART 213774S. 0107539. HTC12 Garden Tiller Centrifugal Clutch. Replacement clutch for Carter Brothers 2.5HP Go Kart with direct drive transmission. FULLY ASSEMBLED! 2” diameter, Threaded Bore, Includes Spring, for HOFFCO/HTC/Comet home tillers. IN STOCK! Genuine Comet Industries, Richmond IN part. 213774S.